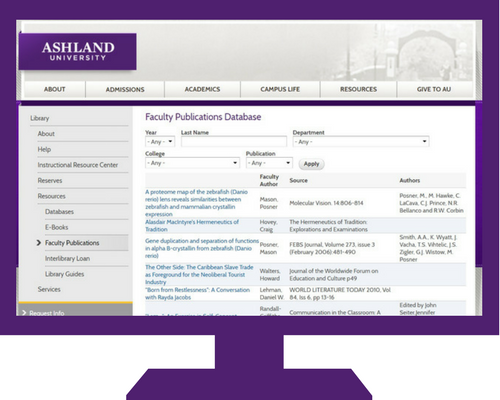 Did you know AU Library has a database of faculty publications available on the library web site? 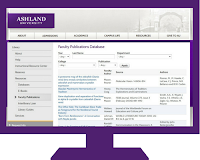 The database is searchable by year, name, department, college, or type of publication, and links to copies of the resource available in our collections. We routinely review MyAU Portal for publication announcements and welcome notifications directly from faculty concerning new publications to add to our database and library collection. Contact the library via email at library@ashland.edu for more information. 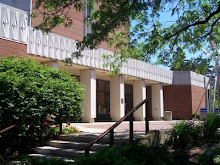 A complete listing of library hours & updates, including holiday & extended hours, is available on the library web site.